A photo of the bear used by NSJP. NSJP’s 2018 conference went forward as planned despite numerous efforts by anti-Palestinian groups to stop it. August-September 2018 Pro-Israel groups launch petitions demanding that UCLA cancel the conference. At a UC Regents meeting, a member of Students Supporting Israel demands that the regents force student organizers to open up the conference to anyone who wants to attend. October 11, 2018 Congressman Brad Sherman writes a letter to UCLA Chancellor Gene Block urging him to cancel the conference. 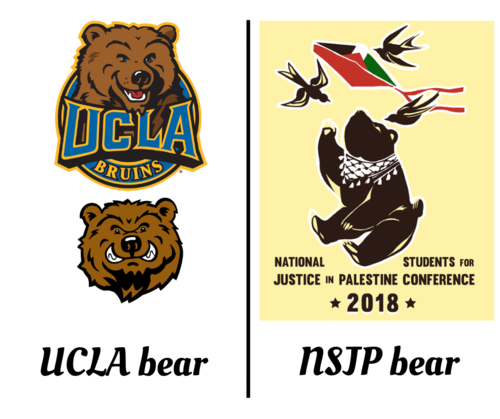 October 31, 2018 UCLA Vice Chancellor Michael Beck sends a letter to NSJP ordering them to “cease and desist” using the UCLA name and bear imagery. The letter threatens cancellation of the conference. November 6, 2018 Los Angeles City Council Member Paul Koretz introduces a resolution falsely accusing NSJP of violence and calling on UCLA to cancel the NSJP conference. The city council votes unanimously in favor of the resolution. Koretz also sends a letter to Chancellor Block calling for cancellation. November 7, 2018 The ACLU Foundation of Southern California and Palestine Legal write to UCLA refuting the school’s claims. The same day pro-Israel protestors at UCLA assault three students while shouting anti-Arab and misogynist slurs. November 8, 2018 UCLA backs down on its cease and desist demands after receiving Palestine Legal and ACLU’s letter on behalf of SJP. November 12, 2018 Anti-Defamation League issues statement claiming that the conference will lead to a hostile environment for Jewish students. November 16-18, 2018 NSJP holds its eighth annual conference at UCLA, with the largest number of attendees ever. November 19, 2018 Pro-Israel group announces that it filed a complaint against UCLA with the federal government immediately after the conference started.